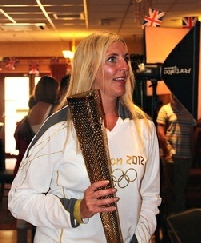 Stanstead Abbotts lady runs with Olympic flame in Hertford. Olympic Torch Reaches Stanstead Abbotts! 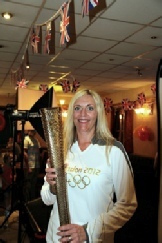 Julie Smart from Stanstead Abbotts carried the Olympic Torch through Hertford as part of the Torch Relay where 8000 runners each took part in this massive 8000 mile relay throughout the UK. 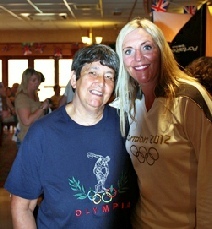 Later she came to the Village Club in Stanstead Abbotts where I was able to speak to her and took some photographs. Note – I was wearing the Olympic tee-shirt which I purchased only two weeks before whilst visiting Ancient Olympia where the flame was originally lit by the sun’s rays! Julie told me that she had nominated herself to take part and below is her nomination story.